It’s Day 6 of 24 Creative Days – The Creative Collective Sweden‘s Christmas calendar – and today it’s my turn to share a project to enjoy before Christmas. If you’ve visited before, you know that I love cake pops. I have a tried and true no-bake recipe that I always use, but this year for Christmas, I’m making cake pops with Swedish pepparkakor (ginger snaps) instead of oreo cookies for a more Christmasy taste. Mine are covered in white chocolate – because white chocolate and pepparkakor taste divine together. You can use candy melts instead – they are easier to work with, give a more snow white finish, harden faster and are more smooth. But if you’re all about the taste, use white chocolate. 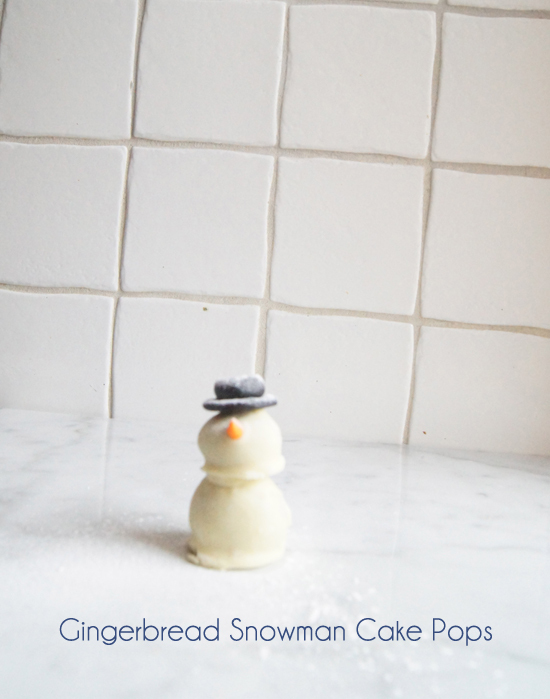 If you don’t feel like making snowmen, just make round cake pops on sticks, dip them in chocolate or candy melts, and add sprinkles if you’re feeling festive. They’ll be a hit at all your holiday parties! Click past the break for all the details! In a mixer or food processor, crush the ginger snaps into fine crumbs. In a mixing bowl, use a spatula to soften the cream cheese and mix the cookie crumbs into the cream cheese until you have a big ball of cookie mix. If you need to, you can chill the mixture for a little bit to make it easier to form balls. Roll the mixture into little balls in two sizes (slightly bigger “body” and slightly smaller “head”) and keep them in the fridge. Make the carrot nose and top hat out of sugar paste (they’re easier to “apply” if they’ve had a few minutes to dry out and harden a little). I colored white sugar paste with gel food coloring and added a bit of icing sugar if the paste got too sticky. For the top hats – make little balls of black sugar paste around the size of an average blueberry. Flatten one ball to make the rim of the hat and press the other ball to make a little cylinder to make the top of the hat. Take the cookie balls out of the fridge around 10 minutes before dipping them so they are not to cold (they’ll expand as they warm up which could cause cracks in your chocolate). Melt white chocolate (or candy melts) in a bowl over a small pot of simmering water. Start with the smaller cookie balls. Put your cake ball in a spoon and pour the melted candy over it with another spoon, then tip it onto parchment paper to harden. Add the carrot noses and top hats before the cake pops harden (if you’re too slow, you can always dip the noses and hats in a bit of candy melt and use that to attach them to the pops). Then dip the larger balls in chocolate the same way. If you want to add confetti sprinkle “buttons” or anything to the body, do it now. Put the heads on top of the bodies just before the bodies have hardened. If you want to add eyes or other details, melt a little dark chocolate and use a piping bag with a small tip to pipe little chocolate dot eyes above the noses. Store them in the fridge in an airtight container. Serve them as is or on sticks. And always remember: if they don’t turn out exactly as you’d pictured them, just dust a little icing sugar “snow” on top and nobody will ever know the difference. Yesterday Malin at Pastill shared how to sew lovely little baby quilts for the Day 5, and tomorrow it’s Gina at Willowday‘s turn – you definitely don’t want to miss that! Follow The Creative Collective on Facebook to keep up with the entire Christmas calendar and lots of other great DIY, food and other crafty tips! Also – super easy and absolutely delicious gingersnap sandwiches with white chocolate filling, gorgeous golden saffron and white chocolate truffles, and the cutest little faux-gingerbread houses to decorate! Åh så söta små snögubbar!